Public infrastructure projects require a coordinated effort by government sponsors, engineers, contractors, service providers and advisers. They also require capital investment in staggering amounts: estimates for planned infrastructure investment are in the range of US$40 trillion globally by 2050, comprising €2 trillion in the European Union by 2020, £500 billion in the United Kingdom by 2020 and C$200 billion in Canada by 2020. The recent €100 billion rescue of Spanish banks pales in comparison. There is a clear and growing role for capital markets in the infrastructure field, as governments continue to add capital and stir. That simplified recipe captures the broad theme of the infrastructure finance market. Yet the particular ingredients and proportions vary greatly across projects and throughout the life cycle of these long-term investments. Capital investment in infrastructure is increasing rapidly, and the infrastructure assets are maturing. The projects themselves are now revolving through different stages and transactions, and the capital markets are increasingly active in that evolving market. 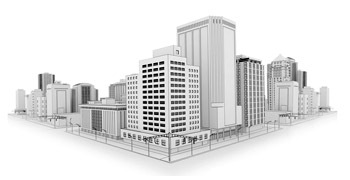 We are in a sustained renaissance period for public infrastructure development and renewal. After several decades of underinvestment, there is a renewed imperative both to catch up on the accumulated infrastructure deficit and to invest in social infrastructure (hospitals, schools and courts) and economic infrastructure (roads, transit systems and ports) for the future. Not surprisingly, a capital need of this magnitude has generated significant attention, promoting the ascent of infrastructure as a newly recognized asset class for institutional investors and financiers. Public finance alone is unlikely to provide the complete solution. In Canada, for example, the planned rate of infrastructure investment is 6 to 10 times the historical rate. Governments simply cannot meet this need alone – particularly in an era of economic austerity – and are looking to the private sector to help mitigate and distribute the financial burden over the long-term life of the infrastructure assets being financed. 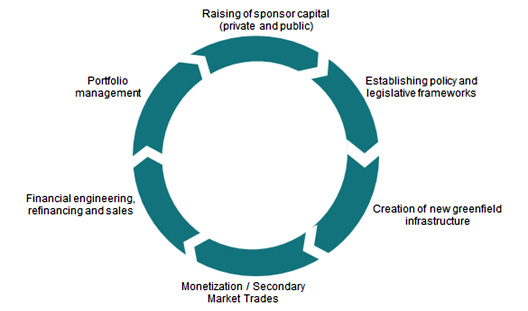 One such approach is to conclude a public-private partnership (PPP) or alternative finance and procurement (AFP) transaction in which a private sector partner will design, build, finance and maintain a public sector infrastructure asset over a period of 20 to 30 years, then hand the asset back to the public sector. A PPP transaction transfers considerable risk to the private partner and contains a performance-based payment mechanism that requires an infrastructure asset to be both built and operational to a specified standard over decades. This approach has repeatedly demonstrated good value for money for the public sector. The PPP approach is not a panacea but has swiftly become a commonly accepted option for public infrastructure transactions, with 170 Canadian projects valued at over C$55 billion completed or underway, most within the last decade. The capital investment in a greenfield asset represents only the beginning of its decades-long life cycle and is followed by a construction stage, an operations and maintenance stage and a hand-back event. Through the life of the infrastructure asset, its financial attributes and risks will change, and the natural and optimal debt and equity financing approaches will evolve in tandem (as shown in this figure). The recent surge in infrastructure projects preceded any planned raising of sponsor capital for that dedicated purpose. In the early stages, equity capital was found among construction proponents, redeployment of real estate and private equity allocations from other established funds, and foreign funds already established for more mature PPP markets in other jurisdictions. More recently, we have seen increasing allocations to infrastructure among pension funds, specialty private placement funds in Canada and the U.K., and the initial public offerings of specialty listed infrastructure funds. For example, Bilfinger Berger Global Investments was listed on the LSE in December 2011 and has a current market capitalization of approximately £225 million. It has a focus on operational or near-operational assets that are beyond the greenfield development phase. Part of its seed investment includes an equity interest in three operational Canadian PPP transport projects. As noted above, there has been a surge in greenfield project development and financing. In the early stages, the Canadian PPP project finance market was dominated by long-term European bank lending and occasionally by monoline-insured debt, with limited Canadian capital market financing. As the volume and tenor of European bank financing diminished and monoline insurance became unavailable in Canada, the Canadian capital markets moved smartly to fill the gap, first in long-term debt and more recently also in short-term debt. In 2009, Carillion Health Solutions reached financial close on the Centre for Addiction and Mental Health project, in Toronto, with C$12 million in short-term bank loans, combined with C$80 million in long-term bond financing rated A- and issued on a private placement basis. In 2010, Groupe immobilier santé McGill reached financial close on the McGill University Health Centre project, in Montreal, with C$380 million in bank debt, C$176 million in government contributions and C$738 million of bond debt issued on a private placement basis. In 2011, Hospital Infrastructure Partners reached financial close on the new Oakville Hospital project, in Ontario, with C$511 million in bank debt and C$592 million in bond debt issued on a private placement basis. In 2012, Capital City Link GP completed financial close on the northeast leg of Anthony Henday Drive, in Edmonton, with C$535 million in long-term bonds. In 2011, the CHUM Collectif reached financial close on the Centre Hospitalier de l’Université de Montréal hospital project with C$458 million in government contributions and C$1.44 billion of short-term and long-term bonds issued. In 2011, Plenary Properties reached financial close on C$167 million in short-term bonds and C$843 million in long-term bonds for the new headquarters for a Canadian federal agency. In 2012, 407 East Development Group reached financial close on the Highway 407 East transaction, in Ontario, with C$870 million in short-term and long-term bonds. Following the relatively high-risk construction phase, during the operational phase many infrastructure projects are considered to be de-risked with post-construction revenues that, although performance-based, are relatively predictable – often supported directly or indirectly by government, and at times GDP- or inflation-linked. In short, perfect matches for pension funds and other investors seeking stable long-term cash flows that yield a premium to government direct securities, but with lower risk and volatility than some other private investments. It is often said that the natural “first trading date” for PPP projects is five to seven years after construction once the project has reached this transition stage. The Canada Pension Plan Investment Board (CPPIB) recently announced that it has entered into an agreement to acquire significant minority stakes in five major Chilean toll roads from the Atlantia Group. The agreement involves CPPIB acquiring a 49.99% interest in Grupo Costanera. CPPIB will commit an equity investment of 560 billion Chilean pesos, or approximately C$1.14 billion, for this transaction. Grupo Costanera is the largest urban toll road operator in Chile and owns a portfolio of five toll roads that span a 188 km network. Four of the toll roads are located in the Santiago metropolitan region, including two major commuter motorways, Costanera Norte and Vespucio Sur. The fifth toll road is located on the central coast of Chile. In 2010, Ontario Teachers’ Pension Plan and Borealis Infrastructure Management acquired High Speed 1, a 109 km high-speed rail line linking London with the Channel Tunnel. There have been fewer such transactions in the Canadian market, largely because our relatively young PPP market has not yet had many projects achieve that state of maturity. It’s reasonable to predict that that will change as the projects themselves mature. It is also likely that funds with a low cost of capital (whether tax-exempt funds, listed funds, unlisted funds, strategic investors or otherwise) will emerge as the natural long-term equity investors in those projects. Tolled projects and other demand-based projects may involve a series of refinancing activities and, with them, opportunities for capital markets activity. However, much of the Canadian PPP market activity has to date avoided demand-based projects and has instead implemented an availability-payment model that does not encourage or reward refinancing activity. To date, therefore, the PPP refinancing market has been relatively quiet in Canada. The capital structure of infrastructure projects will continue to evolve in tandem with the infrastructure projects themselves. We expect that Canadian capital markets will capture a significant share of this vigorously growing infrastructure and PPP financing market. 1 Financial information is as published in InfraNews and Infrastructure Journal. Basel III Revisited: Why Has No Canadian Bank Issued Non-Viable Contingent Capital? Cross-Border Income Funds: A Panacea for Real Estate Investment Trusts? CMHC Insurance and Covered Bonds: What Will Happen When the Training Wheels Come Off?